Hey All! I was invited to hang out over at Broken Treasures today. 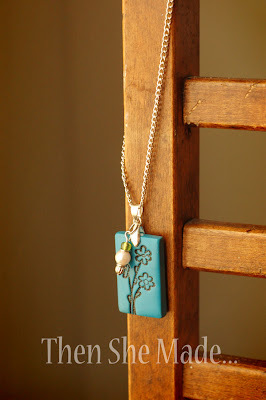 I'm sharing another necklace tutorial and I'm even giving one of them away. If you want to check it out and enter to win, head on over there for all the details. This necklace could be a great one for Mom - you know, for Mother's day! Just sayin'! And, thanks to Elizabeth for hosting me today! Your tutorials are awesome. Thanks so much for sharing. This necklace is gorgeous. I love it! I just visited Broken Treasures and looked at your wonderful tutorial. These necklaces are SO adorable! Thanks for sharing this tutorial on broken treasures. It's so cute and I think my 6 yo granddaughter could make it for her mother with just a little help. A beautiful piece and thanks to your tutorial I have confidence that I could make something similar! Hi! Loving the necklace & joined your giveaway! Great tutorial! I love your necklaces! That is beautiful! One of the ladies I work with just helped a bunch of girls she teaches make some of these like your "courage" ones from last year. I let them use some of my clear stamps but now the stamps will not stick to their sheets. Is this because of the clay dust? If I give them a good washing will they stick again?